About twenty years ago I worked for a large company. The company had just completed a new department and I worked in that department. One day about a year after we had moved into this new wing, I went into the restroom and as I turned the corner, I noticed the stall door closed on the middle stall. The floor under the door looked dark like someone’s shadow was blocking any light. The stall doors naturally hung open, so I just assumed someone was inside the stall. I went into the first stall instead of the second, in order to maintain some privacy by keeping a stall between us. While in my stall, I listened and didn’t hear the other person make any noise. No flushing, hand washing, and no sounds of the door opening, nor a person leaving. So when I finished up and went to wash my hands, I was startled when I looked up into the mirror and saw the third stall door wide open. Not even halfway open, but it was wide open. I finished washing my hands, using the sink right across from the stall I had used and wondered if there had been an optical illusion when I walked in that made it appear as if that third stall door was closed. So as I was leaving, I stopped to turn around and look at that stall again to see if I could recreate the image I saw previously. However, when I looked back, the third stall still looked wide open, and furthermore, it was brightly lit because the room light was getting into it. Just as soon as I saw that, the faucet of the sink right across from that stall automatically turned on full blast. My heart felt like it stopped and I was frozen in place, just staring at the water pouring out of the faucet! After about five seconds the faucet shut off. As soon as the water stopped, I got my composure back and I left the room as fast as I could. I like your story! Very interesting! Did you see the knob of the faucet turn? 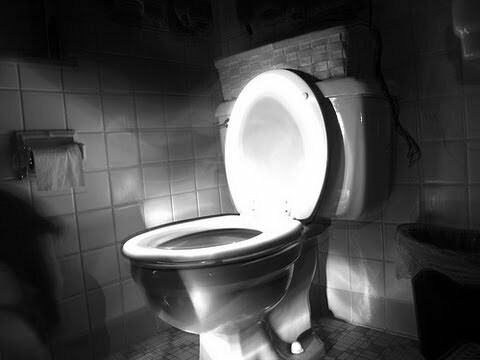 Home » Your True Encounters » February 2016 » Haunted Bathroom?